An analysis released this week by the Center for American Progress posits that closing the racial educational achievement gap will be especially important in the coming decades as the nation's population of color continues to grow. The study looks at American students’ scores on the Program for International Student Assessment -- an international exam taken by students in 65 countries and economies -- and suggests that raising the scores of black and Hispanic children would positively impact the U.S. economy. Study authors Robert Lynch and Patrick Oakford found that if this gap between white students and students of color were closed, the U.S. would see $2.3 trillion in economic growth by 2050. Lynch and Oakford subsequently calculated what America’s 2012 PISA scores would have looked like if there were no racial disparity in scores. Drawing on the Hanushek and Woessmann model, they estimated what the new scores would mean for the nation’s GDP. 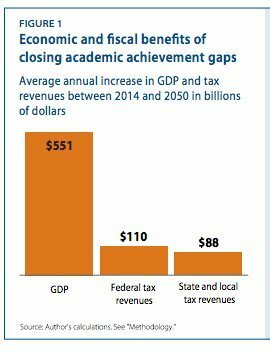 “Our simulation indicates the average annual increase in economic growth that results from the gradual closing of the educational achievement gap and the upgrade in the skill level of the workforce,” the authors write. Oakford, a policy analyst at the Center for American Progress, told The Huffington Post in a phone interview that he thinks the analysis is especially topical this year. 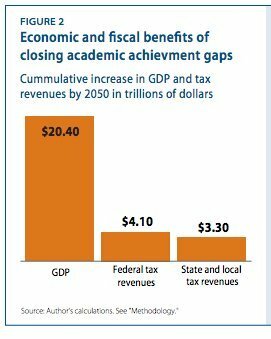 To close the racial achievement gap, the researchers recommend increased investments in a number of social programs, like expanding early childhood education programs, raising the minimum wage and reforming the criminal justice system. "I don’t think there is a silver bullet to fixing the academic achievement gap. I think this requires a host of policies," said Oakford. "Education reform most obviously, but in addition to that, policies that affect a child outside of the classroom." He continued, “Implementing those policies today means we will be setting ourselves up to reap large economic benefits decades down the road."